The JFK AirTrain has seem frequency quietly decrease over the years even as ridership grows. By most accounts, the JFK AirTrain has been a success story. After a fatal incident cast a pall on the project a few months before the planned opening, the AirTrain saw 2.5 million riders in its first year of operations and 6.5 million riders in 2014, its tenth year of operations. Even as Gov. Andrew Cuomo pushes to build a misguided LaGuardia AirTrain via Flushing, the AirTrain has been an improvement for access to JFK airport. Early last year, when making a push for support for his LaGuardia plan, Cuomo touted the benefits of the JFK AirTrain. “AirTrain JFK has proven to be not only one of the most convenient and affordable ways of getting to and from the airport, but also one of the most popular,” he said, noting an eight percent increase in paid ridership between 2013 and 2014 alone. Over 10 million riders use the AirTrain to ride between terminals and nearby garages for free. But a funny thing happened on the way to 6.5 million riders: The Port Authority has quietly reduced the frequency of service on the AirTrain. A few days ago, a Twitter user reported that the Port Authority was promoting 14-minute headways between AirTrains shortly before noon on a weekday. For a zero-person automated system with ample rolling stock to run trains at five-minute headways, this seemed exceptionally egregious, and a few folks went digging. It’s not quite clear when these new timetables went into effect or why. The Port Authority hasn’t responded to requests for comment yet. But posts on an aviation-related message board indicate reduced AirTrain frequency as long ago as 2011. This isn’t a new problem, but it seems to be one the Port Authority has slipped past the public without much notice. Despite silence from the Port Authority on this issue, it’s my understanding that this reduced service is a result of the age of the system and the need for repairs. With cars in the shop and the system’s constantly undergoing maintenance, the Port Authority cannot maintain the headways it used to run seven years ago. For a 12-year-old system, this seems problematic and worse still is the lack of transparency regarding operations. There’s no real need for the Port Authority to keep these issues under wraps, and if the state is about to sink a few hundred million dollars of public funds into another airport rail system, we should know that operations can keep pace with ridership. Right now, the JFK AirTrain remains popular even as service is cut. But trains are more crowded, and travelers have to leave extra time to account for long AirTrain waits. That the PA doesn’t appear to view this reduced service as a problem is cause for concern. But that’s just another day in the fun world of the Port Authority. Due to a variety of circumstances — a post-Sandy rebuild, Positive Train Control installation — the Port Authority has had to shut down one of the two trans-Hudson PATH tunnels at various points over the past few years. The agency has come under fire for not providing alternate service, and they rang up quite a bill for ferry subsidies when the WTC tunnel was out of service. Now, with PTC installation coming to the 33rd St. line, service from Hoboken to Midtown will be out every weekend between now and late December. As part of the service plan, the Port Authority will run free shuttle buses per the map above. Trains will run up 6th Ave. and down 7th Ave. Buses won’t pick passengers up at the new WTC Transit Hub because it’s not really a transit hub, and the buses will mirror existing New York City Transit buses and, of course, the subway. Why, you might ask, is one transit agency bustituting above another transit agency’s perfectly fine service? This is a good question, and it highlights how our region’s separate transit agencies cannot and often do not cooperate. Allowing PATH riders to transfer to the subway and vice versa is simply an economic exchange. The PA could pay the MTA, and the MTA could provide free transfers. One obstacle is how the MTA can’t exchange PATH’s SmartLink cards, but these are solvable operational problems, not intractable obstacles. I don’t know if the PA approached the MTA for a solution; a press official from the MTA is working on finding this out for me. But for some reason, more buses are going to fill the streets of Manhattan when preexisting transit options are plentiful because the PA and MTA can’t cooperate. It’s simply silly. These weekend changes are necessary because of capital construction work on the MTA New York City Transit subway system. This work is part of NYC Transit’s ongoing Capital Rebuilding Program aimed at upgrading and maintaining our tracks, stations and signal systems in order to continue to provide our customers with safe and reliable service. For more information on the 2015-2019 Capital Program log on to www.mta.info/capital. Customers who rely on these lines should allow for additional travel time. Although the MTA often spends money like a drunk sailor ambling from bar to bar, New York’s own agency can’t hold a candle to the Port Authority when it comes to dysfunction and burning dollars. As Gov. Chris Christie continues to check out on the state of New Jersey and Gov. Andrew Cuomo continues to….do whatever it is he does, the Port Authority is reaching new highs, or perhaps lows, in its unconstrained approach to throwing money at every problem. Last week, while I was out of town, the agency approved spending for a new bus terminal in Manhattan that may cost as much as $12 billion, and the price tag for the Laguardia overhaul went up by another $1 billion. Meanwhile dysfunction ruled the roost at the PA’s Board meeting as its current Executive Director Patrick Foye has been held hostage by the bi-state agency’s inability to find someone else willing to take over the top spot. How to save the Port Authority is a very wide open question. It’s hard to know where to begin or who to blame for this mess. I would urge you to read Nicole Gelinas’ take on the dysfunction engrained in the culture of the Port Authority. It starts with a bunch of adults arguing over the scope of their powers and ability to approve projects and ends with an indictment of the two governors who don’t care that the return on their investment of over $20 billion in taxpayer money may not amount to much. The Port Authority of New York and New Jersey is taking a big vote on the redevelopment of LaGuardia airport on Thursday, and thanks to mounting tensions between the New York and New Jersey sides of the famously fractious bistate agency, no one’s quite sure how it will go. According to the agenda the Port released — and that Degnan, as board chairman, controls — if the plan goes through, the Port will have spent “$5.3 billion in cumulative total investment since 2004” on rethinking, designing and ultimately rebuilding the airport, including things like overhead and consultant fees. “The number looks higher because in the past, the Port Authority has been neither transparent nor candid in what the total cost of this project is,” he said. 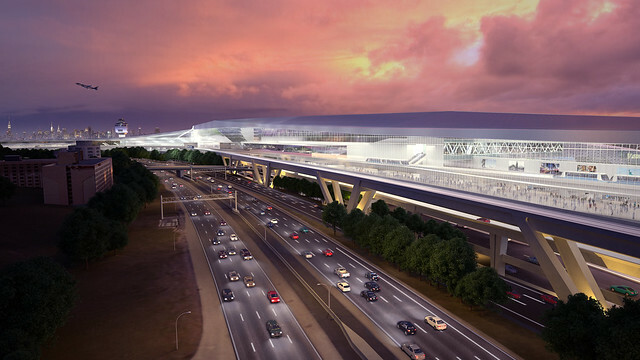 The issue of LaGuardia’s costs has since become a serious source of friction. Rubinstein follows the ever-winding tale of Foye’s retention, the inability of New York and New Jersey to agree on Port Authority reform, and the failure of the Port Authority to find anyone foolish enough to take the CEO job that is supposed to unify two halves of a bad marriage. It’s a mess of provincialism dominated by artificial state borders that ends up leaving citizens on both sides of the Hudson out of control. Is there an escape from this mess? The common refrain on Twitter — disband the Port Authority — doesn’t really get us there because we would then have to replace the Port Authority with something better. Is anything better? Is there a way to run a bi-state agency that doesn’t involve political horse-trading across state and political borders? And how is the Port Authority’s ten-year, $26-billion capital plan getting funded anyway? No one has any ideas, and for that, we suffer. Ultimately, it all makes the MTA look downright competent. I have a series of posts on a few topics that I have in the works, including an important one on the smoke and mirrors behind Gov. Andrew Cuomo’s phony pledge to support the MTA’s capital budget, another on the potential for a looming New Jersey Transit strike, a third on the faulty logic behind the latest effort to revive the F express in Brooklyn, and a fourth on the MTA’s victory in a First Amendment case over transit advertising. But — and you knew there was a “but” coming — I’ve been busy with work and fighting a cold all week. Instead, I’ll leave this list up as a reminder to myself to tackle them soon and a tease for you to come back next week. So tonight, let me offer a few thoughts on the new World Trade Center PATH Transportation Hub/Oculus/Calatravesty/whatever you want to call it. After the part of the building opened on Thursday at 3 p.m., I swung by on the way home from work today. As it stands now, it’s quite a structure. It’s blindingly white, even at night, with long hallways, high ceilings, and a profound sense of emptiness. The columnless structure of the Oculus with its ribs reaching for the stars feels endlessly vast and cathedral-like. All of the people were who were milling about, either to take photos or get to their PATH train, were doing so in a hushed tone usually reserved for religious buildings. As it stands now, half-finished and half-opened, it’s also noticeably vacant. The main hall, which isn’t so much a waiting room as it is a vast and expensive passageway, is ringed with what will eventually be storefronts, but the commercial space isn’t ready. It is nearly impossible to judge the building and its form and function until the mall opens because it is a mall first and a transit center second. Since the Downtown Hudson tubes, well over 100 years old, weren’t shifted eastward, the Oculus isn’t above the platforms but rather serves as the main attraction on an underground walk that will eventually span from Brookfield Plaza to the Fulton St. Transit Center. It’s not quite a train station; it’s not quite a subway stop; and it’s not quite a mall. But it’s more the third than the first two. One element of the building stuck out at me, and it’s something I’m sure Santiago Calatrava must hate as well. As the silence fills the Oculus, the only sounds are the constantly repeating and far-too-loud instructions emanating from speakers in the numerous escalators that ring the structure. Stand forward; walk lively; don’t run; hold the handrail; keep children in your sight: don’t use the escalators for oversized luggage; and on and on and on and on through the night. I don’t know if these stem from fear of a negligence lawsuit or ADA requirements, but they could not be more disruptive or annoying to ethos of the building. If they’re not mandated message, turn them off. We all managed to use escalators just fine yesterday; we’ll do great without hand-holding announcements tomorrow. Finally, there is still the matter of this structure as a train station, and so far, the early concerns about narrow staircases leading to platforms that cannot handle peak-hour crowds remain a glaringly obvious problem with something that was supposed to be a selling point. How did the Port Authority fail to construct enough staircases that also wide enough to handle people flow? Why did the train station elements of the building come last? Needless to say, my thoughts don’t touch upon the leaks that have plagued parts of the building still not open to the public, the constant need to clean and buff the slippery floors, or the cost. That’s the $4 billion white marble and steel elephant in the room. But even though the building hasn’t yet fully grown into itself, I’d urge you to check it out. It is certainly a sight to see. Plus, you can take some fun selfies. No trip to the PATH Hub is complete without an obligatory selfie. Later today, at around 3 p.m., some of the World Trade Center PATH Hub’s Oculus building will open to the public. It’s a $4 billion project that has been delayed for years, and its opening is almost a sigh of relief rather than a celebratory moment. What’s clear is that the Port Authority is overstating the building’s importance and using ridership figures from the soon-to-be connecting Fulton St. subway station to bolster the projections of the number of people who may pass through the Hub’s free passageways. What’s also clear is that I’ve used the Hub as a whipping boy, fairly or not, for the region’s inability to prioritize and spend properly. Over the past few years, I’ve been accused of being unable to see the forest for the trees. As some commenters have stated, they feel I wouldn’t be happy unless we build utilitarian boxes a la grungy Penn Station and spend the billions on capacity and capacity alone. To defend myself, I don’t believe that’s true. We should be able to build great public spaces while also expanding transit capacity at the same time, but I don’t have a magic formula in mind. Can we spend $1 billion — an absurd amount by itself — on architecture to every $3 billion we spend on expansion? That seems reasonable, but for $4 billion, we’re getting great architecture with no expansion. That’s where I draw the line. Today is essentially the last day for us to really take stock of the PATH Hub. Once it opens and becomes a part of the fabric of New York City rather than a construction site, we forget about the problems, the delays, the costs. Still, as future generations of New Yorkers look to expand our transportation footprint and even as a few miles up north, Gov. Andrew Cuomo prepares for a $3 billion overhaul of Penn Station that may or may not accompany an increase in capacity, we can draw lessons from the Calatrava Hub. As soon-to-depart PA head Patrick Foye has noted, with transit dollars so scarce, it’s important not to waste them. The Oculus…is the exhilarating nave of a genuine people’s cathedral. It is a room that soars; under a great arc of glass, Calatrava has put together curving ribs of steel to make a space that is uplifting, full of light and movement, and capable of inspiring something that has been in particularly short supply at Ground Zero, which is hope. Back when the 9/11 memorial opened a few years ago, I recall Michael Bloomberg saying something to the effect that people only complain about cost and delays when a project is underway; that once it is done, if it is any good, they forget all of that and pay attention to the thing itself. The Transportation Hub and its Oculus will put the Bloomberg Doctrine to a test, but I suspect it will pass, and that a couple of years from now, we will be hearing not about what this thing cost or about how long it took to build, but about how much people like walking through it. I certainly hope so, since nothing would be worse than to have it provoke a backlash against spending money on infrastructure. At a time when this country spends far less on public works than it should, the Hub is a rare exception to the trend. Its best legacy would be to encourage us to take more chances, and to recognize that investing in the public realm isn’t throwing away money. It is investing in the future, a gift from our generation to the ones that follow. I appreciate Goldberger’s words, and as I chewed them over throughout the day on Wednesday, I worried that we might forget the transportation element of this project. We certainly do need to spend on public works and integrate them into our transportation infrastructure. After all, a nicer train station is one that draws people to the services it offers, but at the same time, we cannot invest all of the public money in form over function. Unfortunately, for a variety of reasons, that’s what happened at the World Trade Center site. Let’s build great public spaces without sacrificing all of the dollars to the need for beauty as without expansion we will go and grow nowhere. In a few weeks, the Port Authority’s long-awaited, $4 billion subway stop designed by Santiago Calatrava will open for passengers, and when it does, it will open not with a bang but with a deafening whimper. This project, a toxic mix of bureaucratic bumbling, absurd cost overruns, conflicted city and state oversight driven out of control by a lack of interagency cooperation and onerous security concerns, and a starchitect who took advantage of a client unwilling or unable to a say no, doesn’t even have the Port Authority’s enthusiastic support, and the agency essentially said on Monday it won’t even hold a ribbon-cutting ceremony for a building so important that it could wind up on New York State driver’s licenses. The news of a quiet opening came to us from Dana Rubinstein. As she reported, the Port Authority is too embarrassed by the bad publicity and price tag attached to this project to hold an opening ceremony. There will be no ribbon-cutting, no giant scissors, no self-congratulatory press conference. Instead, New York City will get a $4 opening for a $4 billion colossal. Meanwhile, as the building gears up for its silent opening, the Port Authority has conducted a few preview tours of the space, and the early word has been decided mixed. Justin Davidson, writing in New York Magazine, found the space visually arresting but also could not look past the price tag. Meanwhile, The Post’s Steve Cuozzo, a frequent critic of the expense of new transit buildings, did not mince words in slamming the building. The Oculus, which will partially open to the public the first week in March, is as functionally vapid inside as it is outside. It’s a void in search of a purpose other than to connect a bunch of subway and pedestrian corridors and concourses with one another. The ribs rising to a 22-foot-wide skyline frame an impressive ovoid space, for sure. How could a white marble floor 392 feet long, 144 feet wide and a ceiling 160 feet high at its apex not be impressive? But what will the public find on the vast, 56,448-square-foot floor? Nothing. Not a seat. No newsstands or snack concessions. No central information kiosk like the one that provides a focus to the main hall of Grand Central Terminal, to which Calatrava and the Port Authority presumptuously compare the hub. Why? An empty floor was Calatrava’s idea. But also, the PA plans to pimp out the Oculus as an event venue, and any installations would get in the way. (How transit riders will make their way around weddings and corporate celebrations remains to be explained.) …The passageways, to open later this year, will let you walk underground all the way from Brookfield Place in Battery Park City to William Street via the MTA’s Fulton Center — although, except in a blizzard, most of us would rather enjoy the sights and sounds of the streets. At a time when urban design is focused on vibrant street life and local pride, the Calatrava hub is mall above a modestly-used subway station. Its cost is disproportionate to its impact as, on a weekday, the Port Authority counts around 50,000 passengers — on par with the 14th St. subway station that spans the 7th Ave. IRT and 6th Ave. IND and 14th St. BMT platforms. On weekends, the $4 billion subway station sees around just 10,000 riders on Saturday and under 9,000 on Sunday, placing its weekend tally on par with the 6 train’s Parkcester Ave. or 28th St. stations. Imagine if someone proposed spending $2 billion on those stations, let alone $4 billion. Ultimately, Foye is rightly concerned about the role this building plays in the transit discussion. He has repeatedly called it a “boondoggle” and isn’t afraid to address the fact that the Port Authority isn’t getting much bang for its buck. After all, the $4 billion investment doesn’t include increased service to and from Jersey City, a guarantee that the Port Authority won’t curtail 24-7 PATH service, a connection to Brooklyn, or a one-seat ride to JFK. We don’t know what future awaits the PATH Hub. As of mid-2013, the Port Authority had hoped to draw retailers willing to spend $550 per square foot to rent out the commercial space, which would make the building yet another mall and one that sits just a block away from the mostly-empty Fulton St. Transit Center, another $1.4 billion expense of questionable return. Yet, will New Yorkers care in 20 or 30 years? New Yorkers of 2035 or 2045 might view the Calatrava hub as something that’s a natural part of the landscape, a mall like the Time Warner Center that no one really wanted but grew to an accepted part of the New York City landscape. But today it reeks of excess and waste that we cannot claw back. That missed opportunity will ring through the decades as well, a sad reminder of opportunities squandered at a time we could least afford to flush transportation dollars down an oculus-ringed drain. The post-Super Bowl party clean-up got the best of me on Sunday. So I didn’t have time to write up a full post with additional reaction to the Brooklyn-Queens Streetcar and the realpolitik behind the mayor’s developer-backed initiative. As you might guess, that’s coming later tonight. In the meantime, two links for you to browse today. If you listen to NYPD brass talk about the subway, it’s a dangerous place where too many riders are creating unsafe conditions because they keep jostling each other and also it’s not crowded enough at certain times. In other words, none of it makes much sense, and the contradictions are laid bare in this unsigned editorial that relies on anecdotes from unnamed police officers to make it sound like the subways are more dangerous than ever. They’re not, and in fact, despite a spate of recent slashings, the subways are safer than they’ve ever been. A small uptick in crime numbers this year and last hasn’t kept pace with massive ridership gains, and the crime rate underground is at a record low. Sure, I understand that it’s annoying to get screamed at by a crazy person, but you have to be pretty stupid, insecure, or insane yourself to get upset by it. Take a deep breath, summon up some sympathy for the poor, afflicted soul who’s causing the trouble, and then feel lucky that you had the presence of mind to avoid a preventable altercation. Seven out of ten of this year’s subway stabbings and slashings happened because people ignored this advice! Don’t let that happen to you…Our subways and our streets are safer now than at any time in the last forty years. By promoting the idea that the subways are somehow unsafe when they are not, the NYPD is, intentionally or not, undercutting public support for a vibrant subway system. That’s a dangerous, dangerous game to play. For your weekly dose of Port Authority hate, check out Seth Barron’s magnum opus on the agency’s incompetence and corruption. For those who have followed over the years, Barron’s piece treads familiar ground: no accountability on either side of the Hudson, no ability to set priorities or control costs, and no real long-term vision all plague the Port Authority as it has deviated from its core mission. Barron toys with dismantling the Port Authority entirely but realizes there are considerable obstacles to such a plan. But no politician has an appetite for reform. It’s as close to an intractable problem as the region’s transportation structure has right now. A few weeks ago, word leaked that March would see the debut of New York City’s newest new subway headhouse. This one is unique as it cost $3.9 billion, features a future mall and will leave a massive mark on the Lower Manhattan streetscape and internal skyline. 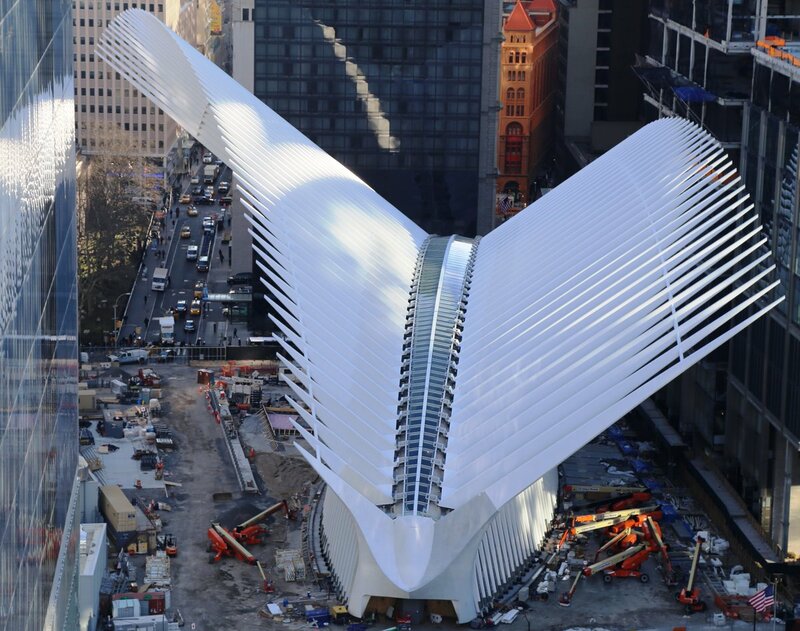 I am, of course, referring to the Port Authority’s Santiago Calatrava-designed World Trade Center PATH so-called “transportation hub,” a brilliant bit of branding I’ll discuss shortly. When I wrote about the opening last month, I trod familiar ground bemoaning the lost opportunity to do something better with the $4 billion. The PATH Hub looks spectacular, cost far too much and did nothing to improve mobility. There’s no connection to, say, Brooklyn or JFK Airport, an old post-9/11 idea for Lower Manhattan, and the money didn’t go to expansion of trans-Hudson rail capacity. It’s a mall on top of a subway station designed by a starchitect. “The Port Authority has a rich tradition in pushing the envelope and being the premier master builder in the region. The rebirth of the World Trade Center and the construction of the Transportation Hub touched not only Lower Manhattan, but the rest of the country and the world as well. We can all stand in awe with what has been accomplished here,” said Port Authority Vice Chairman Scott Rechler. Where to begin? Where to begin? First, the Port Authority claims 100,000 weekday PATH riders travel the station, but PATH’s own ridership numbers betray this claim. In October of 2015, the region’s busiest transit month in sixty years, the Port Authority’s own ridership numbers [pdf] show only 52,595 riders on an average weekday. Ridership isn’t going to double when the “hub” opens, and in fact, it can’t because the PA spent $4 billion on a station headhouse than on capacity increases! Meanwhile, just look at these turns of phrases. The hub is going to offer underground walkways which connect to Fulton St. and nearby subway lines. There are no free transfers, but this is a “seamless connection.” The $3.9 billion also bought “state-of-the-art escalators and elevators.” Fancy! Degnan, Rechler and Foye also issued some gems. The PA is now the “premier master builder,” and the subway station will be a “vibrant transit center and tourist destination,” the latter which may have been the point all along. So what is the WTC PATH Transportation Hub then? To call it a hub is misleading as it is simply a station headhouse for the 18th busiest subway station in New York City. It’s not an intermodal connection by any means, and it certainly isn’t a terminal point for a commuter rail line or long-haul rail road. The building looks impressive; the branding is on point; but it’s all smoke and mirrors. We spent $4 billion and got a mall down the block from $1.5 billion mall. Hopefully, someone in Albany is listening, and we won’t repeat the same mistake with a $3 billion mall at Penn Station. After all, for $8 billion, we could’ve covered those ARC cost overruns years ago. By many accounts — some more concrete and reliable than others — the seemingly never-ending construction of the Santiago Calatrava-designed World Trade Center PATH Hub is holding up a lot of other ancillary transportation-related work in and around Lower Manhattan. The retail, for instance, at the Fulton St. Transit Center has been slow to arrive as Westfield, the lessor for both spaces, is working through which companies will open where and when (and which space is more desirable). A few blocks away,the Cortlandt St. 1 train stop, shuttered since the Sept. 11 attacks, won’t open until 2018, in part because of the lengthy delays that have plagued the WTC site rebuild efforts. Now, though, as 2015 wraps while construction on the PATH Hub hasn’t, an end is in sight. According to a report late last week from Politico New York, Calatrava’s porcupine-esque building will open in March, nearly seven years later than originally promised by then-Governor George Pataki. In a short article, Dana Rubinstein reports on the opening date, rehashes the problems that have plagued this project and notes that the mall elements won’t open yet because they’re already leaking. I guess $4 billion just doesn’t go that far these days. I’ve been an outspoken critic of the Calatrava boondoggle for years. It’s a $4 billion shopping mall that happens to house a train station, and it’s design is ostentatious in every way. From gleaming white marble that needs to be constantly cleaned to a lack of adequate staircases from track level to the fact that $4 billion resulted in no increase in trans-Hudson rail capacity, the station has been designed to be a great building first, a mall second, and a transit improvement a distant third. Now, I can’t deny that the building is a sight to behold. It’s certainly something unique in New York City, and we should be trying to design transportation hubs as great public spaces. Utilitarian functionalism resulted in the current Penn Station — which isn’t particularly functional. Hopefully, it can get people excited about taking the PATH. But. Of course you knew there was a but coming. From a cost-benefit perspective and from a usage perspective, the dollars are simply out of control. The Port Authority claims that 200,000 daily commuters will use the PATH Hub once completed, but these numbers defy reality. In 2014, the most recent year for which we have data [pdf], average daily weekday PATH ridership at the World Trade Center was 46,726, and there’s no way a station that doesn’t increase train capacity is going to usher in a four-fold jump in ridership. That 200,000 figure is likely from people coming from other subway stations who will walk through the mall part of the WTC Hub. So in the end, the Port Authority spent $4 billion and over a decade building a monument to serve as the headhouse to what essentially the 18th busiest subway station in New York City with slightly more riders per weekday than the Canal St. complex that serves the IRT and BMT on the East Side. If I’m a bit disillusioned by the dollars and less than impressed by the building, perhaps you’ll understand. With money to burn, the Port Authority squandered an opportunity to invest in capacity upgrades for the sake of appearances. The pols will gather to cut some ribbons in March, but we should learn these lessons now. Calatrava’s PATH Hub will be a monument unto itself and unto the folly of spending improperly. As United investigation continues, what future the Newark PATH extension? 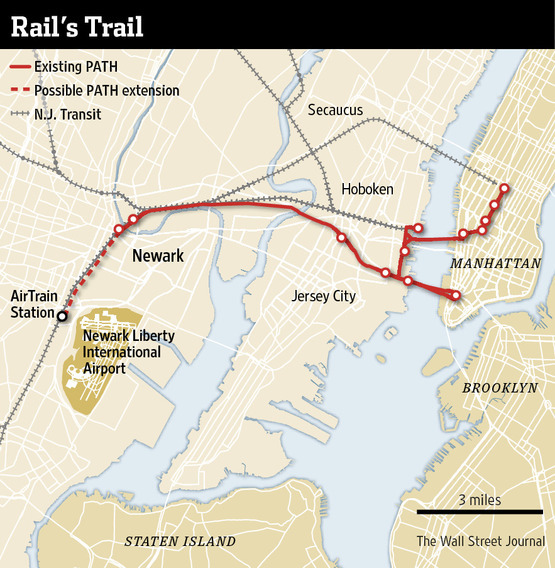 Will a federal investigation or a $2 billion price tag sink the Newark PATH extension? New Jersey Governor Chris Christie is continuing his push for the White House as trouble circles a few of his pet projects back at home. As an outgrowth of the investigation into the George Washington Bridge lane closure scandal, United Airlines’ CEO and two of the airlines’ top executives resigned, and the feds haven’t closed the books on potential criminal charges. In the background — or perhaps the foreground of this mess — is the Port Authority and the planned PATH extension to the Newark Airport train stop. We first heard of the latest iteration to send the PATH from Newark Penn Station to the airport two years ago when news broke of a $1 billion plan Christie had been considering. Eventually, the costs grew to $1.5 billion, and as I explained in my last post on the project ten months ago, it was overpriced, underutilized and inefficient. The costs, as you’ll see, may now be around $2 billion, and a multi-billion-dollar extension to a transfer point to an AirTrain already served by rail with a projected daily ridership of 6000 is simply a terrible use of the finite dollars available for transit expansion. Meanwhile, underlying the initial proposal was a sense that something else rather than rational transit planning was driving this project forward. Ted Mann first wrote about the horse-trading with United back in September of 2013. Reportedly, Christie’s team had asked for United to serve Atlantic City in exchange for state support and funding for the PATH extension. It was politics at its finest. Now, certain Garden State factions want to put a hold on the PATH extension, and it’s creating tension in Trenton. Earlier this month, state lawmakers urged the Port Authority to put the project on hold at least until the feds are through with their investigation. “The Port Authority should suspend any further spending on that project until United Airlines’ internal investigation, the findings, become public, until the criminal investigation of that becomes public,” NJ State Senator Paul Sarlo said. …James, who represents the city’s South Ward, said residents of the Frelinghuysen and Dayton Street area, where the extension and a new train station would be built, are counting on it to bring jobs and new fortunes to an area that has long been rife with crime and abject poverty…Following news of the Port Authority’s commitment to the extension, multiple hotels have begun plans for construction in the areas outside Weequahic Park, which officials have hoped might spur further development in one of the city’s most economically depressed neighborhoods. James said he was concerned that those calling for a halt to work on the PATH line might have reservations beyond any potential malfeasance by United. During last week’s hearing, Weinberg said the nearly $2 billion the project might require might be better used on a new Port Authority Bus Terminal or the proposed Gateway trans-Hudson rail tunnel. “I believe the folks who have been talking have their other pet projects they want to fund,” James said. There’s very little doubt that “pet projects” like a trans-Hudson rail tunnel would be far better for the region than a PATH extension that won’t stop between Newark and the airport. But that’s besides the point. The latest version of the PATH proposal may have come about through illegal backroom dealings, and even if it didn’t, at $2 billion, this is a laughably terrible idea. With this price tag, we’re through the looking glass on lack of bang for the buck, and the Port Authority should not proceed with this project. If it takes a major investigation into malfeasance between the state of New Jersey and United to get to that point since politicians won’t or can’t look at it rationally, so be it. I’m sure this isn’t the end of the line for this story though.